i made a new dress last week! i am just slow about updating this blog, i guess. anyway, the dress! it’s the crepe dress pattern by colette patterns. 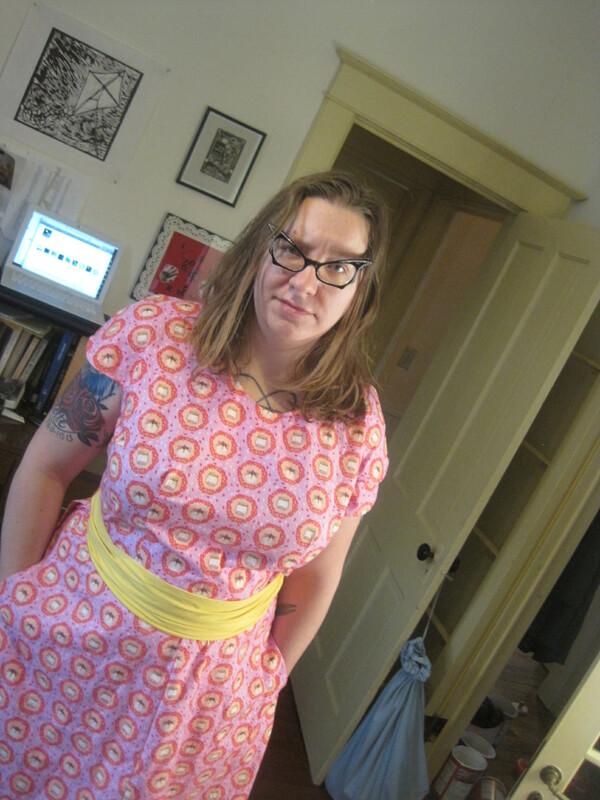 i used a print from the wee wander collection & solid yellow for the waist tie. this dress was also my first experience with fusible interfacing, which was very easy to use, & with making facings (for the neckline & the sleeves), which was an exciting new skill to try. i did french seams on all the skirt seams that didn’t involve pockets (it’s a wrap dress, so there were a lot of skirt segments to sew together) & bound the waist seam with orange bias tape. the dress looks especially cute here, & you can see i’ve got my hands in my pockets, but i didn’t realize the sleeve facing was sticking out. i love this dress! i’ve been wearing it a lot since i made it. jared & i left ramona with a sitter that is not related to her (jared’s history department colleague, allison) for the first time ever on friday night so we could go see jonathan richman at the bottleneck. i wore my dress & my new purple fluevog ballet flats, which i have yet to photograph. i was a tiny bit self-conscious because i felt “dressed up” wearing such a bright dress & new shoes, but it was also a good look. some acquaintances were there & they seemed impressed that i managed to sew this dress up in only two days. i probably could have done it in one, but you know–i do have a baby to look after. thankfully, ramona has been giving me some good naps lately, so i’ve been able to get in a fair amount of sewing time. it’s also better for me to take my time with sewing projects a little so i don’t start rushing & get sloppy with the details. on the topic of sloppiness, i admit i probably got sloppy with the hem. straight out of the envelope, this dress is LONG. though i guess i’m not that tall. i’m only 5’5″. but still! had i not shortened it, it seriously would have come within a hair’s breadth of my ankles, which was not the designer’s intention, i’m sure. i cut two inches off the hem while i was cutting my fabric, & i wound up making a four-inch hem. so i lost six inches of length altogether. the hem looks fine from the outside, but the inside is very puckery, which could have been avoided if i’d just taken my time with it more. but the hem was the last step of the process, & i was just rushing to get it done. i’ve already gotten several compliments on this dress, & i would probably make it again. it was pretty easy–especially the fact that it has little cap sleeves that are part of the bodice. i am looking forward to learning how to set in sleeves, but i’m not sorry i didn’t have to do it here. i did end up hemming the circle skirt part of my cat dress yesterday & wore it to jared’s first soccer game of the season. it’s amazing how much better-sewn the firefly dress is in comparison, considering that only about a week elapsed between the two dresses being made. i used bias tape as a facing on the cat dress, but i was sloppy & impatient with it, & there are places (especially on the waist) where it sticks out too much. i think this was a function of not really understanding what a facing is or how it’s supposed to look. 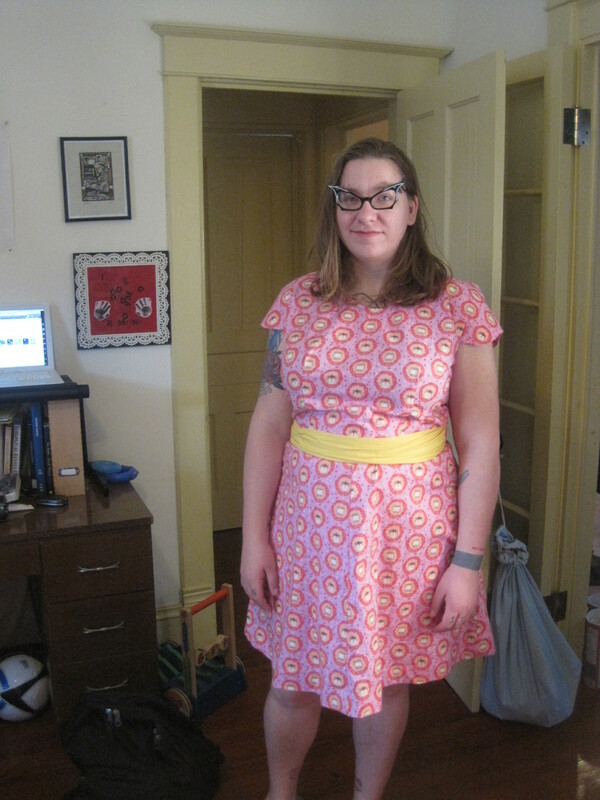 it’s fine–i still think the cat dress is perfectly cute (especially now that i’ve hemmed it so nicely). i’m just reflecting on how much i’ve learned, & how much there is to learn, about sewing, & how much i am enjoying the process of trying & learning new things. 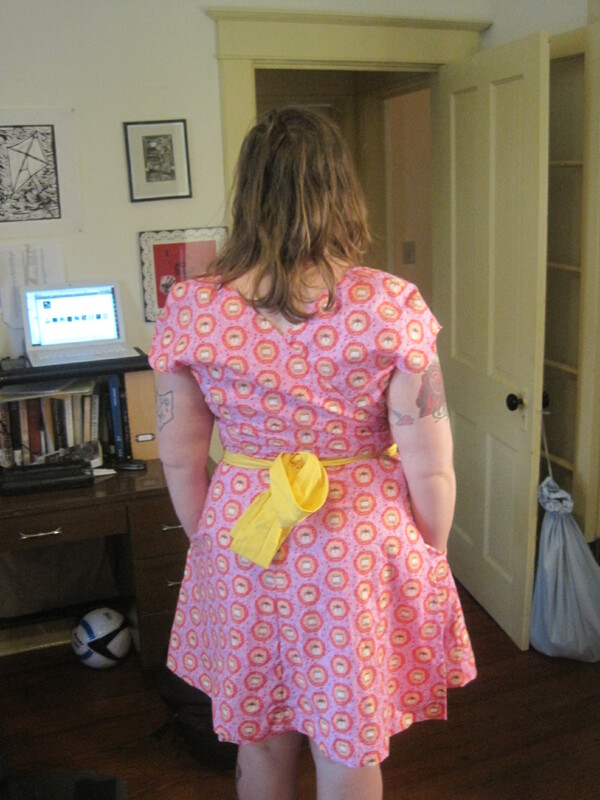 if i made this crepe dress again, i might consider lining it. maybe. it already requires a lot of fabric, & lining it would double the fabric allowance, but if it was lined, i’d have more places to tack down the facings (or i suppose i could eliminate them altogether). i tacked them at the seams, but obviously if i tack them anywhere else, the stitches will show on the outside, & they do flip out sometimes, which is annoying (especially on the sleeves). i would also consider interfacing the waist tie because it twists & bunches really easily, & obviously it looks best if it stays wide & flat. i might also make the bodice maybe an inch longer, because as it is, the waist tie has tendency to ride up above my actual waistline. 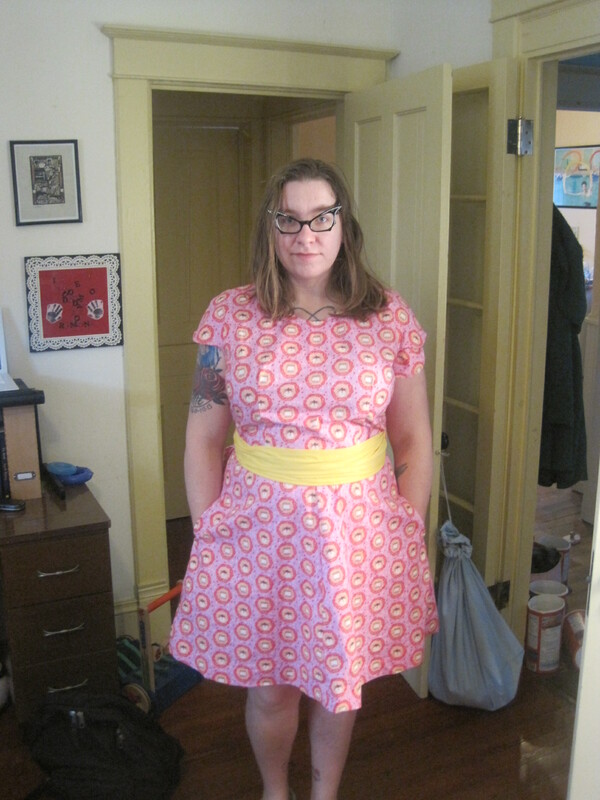 i’ve heard of people making this dress reversible, which seems like a fun experiment. i think my next dress project will be a heavily modified licorice dress, by colette patterns, in multi-colored cassette tape print fabric with purple organza accents. stay tuned! Awesome dress & wow I love those glasses! thanks & thanks! the glasses are from eyeglassboy.com, if you are interested.